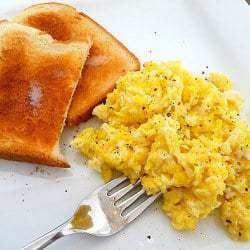 Make the perfect scrambled eggs with this recipe! 1. Heat skillet over medium-low heat. Slow and steady wins the race when it comes to scrambled eggs. Remember the story of the tortoise and the hare? The same holds true here. Don't rush your eggs and you will be rewarded. 2. Add about a teaspoon of butter to the skillet and let melt. 3. Break the eggs directly into the pan. I know this flies in the face of what most know when it comes to scrambled eggs, but trust me! 5. Using a wooden spoon, continually stir the eggs, scraping the bottom of the pan. 6. When the eggs are almost done but still on the wet side, add the Tablespoon of milk and continue to stir the eggs just until the milk is absorbed. 7. Turn off the heat, serve the eggs and season with additional salt and pepper, if desired.